Science as a destiny: Genes for Jeans day tomorrow! Genes for Jeans day tomorrow! On Friday 19 th September, many people will be donning their denims at work or school to raise awareness and funds for research into genetic disorders. Some, such as cystic fibrosis, are well known, others - including the painful skin condition Icthyosis - less so, but all limit the ability of those affected to enjoy lives as full as their contemporaries. It can be easy to forget these conditions in the face of the global empires of cancer, HIV, malaria, etc, but as we gain increasing knowledge of the mechanisms behind genetic diseases, there is hope that one day there could be real treatment against these. Jeans for Genes originated in the 1990s, as part of a family's efforts to raise funds for The Chronic Granulomatous Disorder Society. Two brothers within the family were affected by this condition which hinders the ability of the body's immune cells to kill pathogens. The idea has since grown into a national event to raise money for Genetic Disorders UK, which supports families affected by genetic conditions. This year, Jeans for Genes has worked with Edinburgh College of Art to produce a series of limited edition T-Shirts. 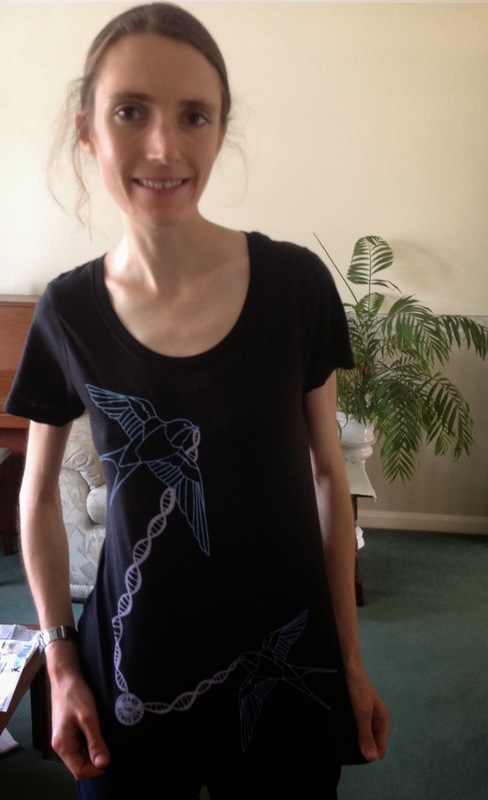 To me, the design is a perfect combination of promoting my scientific interests whilst supporting a valuable cause. It is also brilliant to use science to make a fashion statement! Or should that be the other way around? With so many pressures facing our world - food security, health, energy generation- scientists often have to stretch their creative powers to garner enough funds to persue their work. It is difficult when there are so many promising avenues of research for funding bodies to decide between them. But the public can play their part so I shall wear my T Shirt with pride. If it's too late this year for you to organise an event with your colleagues, why not resolve now to wear your genes on Jeans for Genes Day 2015?